In July each year, a Rotary club sets out its service program for the year ahead. There may be a major program chosen as the main beneficiary of our funds or labour. Other projects may also arise in the course of the year but there are core projects that the Club undertakes each year. Scholarships and awards are given to selected school students.  In Year 9, students who are nominated as “having potential” but need motivating, attend a weekend course called RYPEN (Rotary Youth Program of Enrichment). Post High School students with proven leadership qualities in other areas attend a week long camp of concentrated activities and lectures to hone their leadership skills – RYLA (Rotary Youth Leadership Awards). For two weeks in January, our brightest science students are selected from around Australia to extend their knowledge with our top scientists in Canberra (Youth Science Forum). Once a year we arrange for two or three young people to be part of an exchange program with young people from the Pacific Islands (Fiji, Samoa, Tonga) – PACE (Pacific Australia Cultural Exchange). We invite our schools to nominate 16 year olds who have been outstanding achievers – ROYA (Rotary Outstanding Youth Achievement). Each year the Club donates $500 to Katoomba High School towards their prize fund. These young people bring most interesting reports back to the Club. 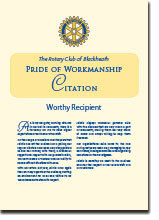 The Club makes several of these awards each year to business people and/or their employees, nominated by Club members who consider them to have “gone the extra mile “ in their business or professions. Katoomba, Central Blue and UBM Sunrise Clubs join with us each year for this event. A familiar sight at most outdoor events is Blackheath Rotary’s custom built catering Bun Wagon. Apart from drinks and the sought after menu of hot food, the wagon provides a great service to our community organisations as well as adding to our project funds. Sometimes we simply donate our profit to the organisation of the day. 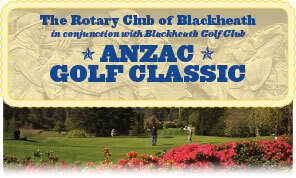 On or around Anzac Day each year, Blackheath Golf Club assists us in staging this very popular Golf Day. It is generally our major fundraiser for the year. See the special Anzac Golf Day page. The Committee organises social events each year apart from major functions of the Club. They may consist of a car trial, a day at the races, a visit to a winery or other places of interest. 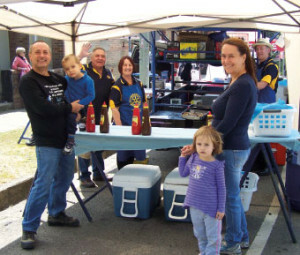 We often join other Rotary Clubs in the upper Blue Mountains for similar outings. YOUTH EXCHANGE – When enough host families are available the Club may host a student from somewhere in the world and send a local student to another country. The participants are around 17 years of age and may be children of Rotarians. They normally stay with each host family for three months during their year away. ROTARY YOUTH DRIVER AWARENESS (RYDA) – A concentrated road safety program in which the Club sponsors participants from year 11 in one High school. SHELTERBOX – This very popular project is becoming an ongoing focus for fundraising in the Club. A Shelterbox comprises a large box with a tent and sleeping bags, cooking equipment, tools etc., enough to provide shelter for 10 people and is dispatched to disaster areas on a needs basis. Our Club also responds to local and international emergencies when appropriate. For example, we have provided much needed financial assistance to the residents of Mt Victoria who lost their homes in the 2013 busfires. And in the aftermath of the devastating earthquakes in Nepal in 2015 we quickly funded the provision of four Shelterboxes.